32 Animals That Are Going to Be Extinct Soon (Endangered Species Ranked by Current Population Left) #infographic ~ Visualistan '+g+"
It’s no surprise to most people that many animals around the world are in danger. What is surprising is just how few of some species are actually left on earth. The vaquita, for example, is a type of porpoise with fewer than 30 estimated to exist currently on the planet. Pretty scary, right? However, it’s important to consider other factors when determining an animal’s priority on the WWF endangered species list. Things like the animal’s reproductive rate and cycle are as important, if not more important, than an animal's current numbers. 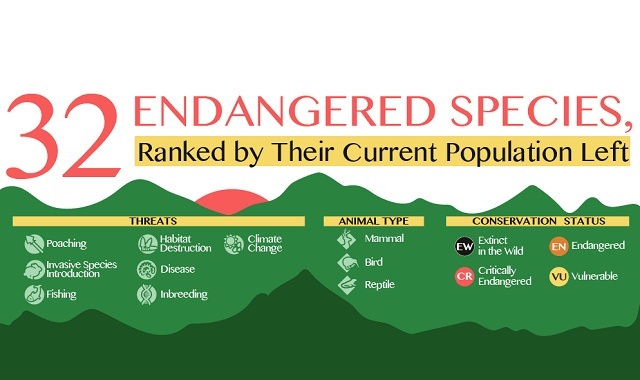 This infographic from AlansFactoryOutlet.com highlights 32 critically endangered animals, ranked by their current numbers left. You may be wondering why some animals are not present on the list. The answer is that, while some animals may have relatively low numbers, their reproductive rates are faster, which keeps the species going. From pandas to porpoises, and from tigers to gorillas, educate yourself on some of the world’s most endangered species, and learn what you can do to help!